I've got mixed feelings about this chair. On the one hand it's got a high funk factor, but on the other it might be just a bit too Jetsons for me. 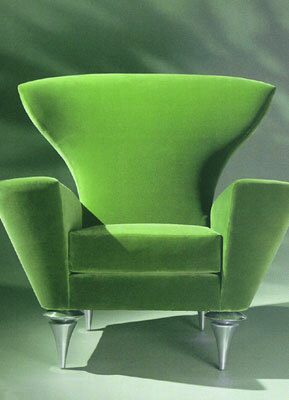 It's made by Goodman Charlton Inc., and it's actually quite comfortable as funky chairs go. It's nicely padded but doesn't feel like you're sitting on puff, and it's roomy enough that you can curl up with your knees under you and not feel cramped. The legs on this chair sum up my feelings about the whole rig. I love them. Made of aluminum and styled almost like stilettos. But I don't have a lot of aluminum stilettos, so I don't love them in my house. The only place I've seen this chair is in Design & Comfort in New York, and on the Goodman Charlton Web site. It runs a bit over $2,000. I love the chair - so funky, so cool. I have this chair in black. Have had it for a couple of years now. I love it! Sometimes I come out of my home office & take conference calls sitting in it. The arms are wide enough I can put the whole speakerphone right on one of them. It's great. I bought mine from Terri Mechanic at Cantoni in Irvine, CA.